I love adding a grilled, smoky, caramelized flavor to corn. Grilling outside in the summertime is delightful! The whole neighborhood will benefit from the wonderful aroma, too! 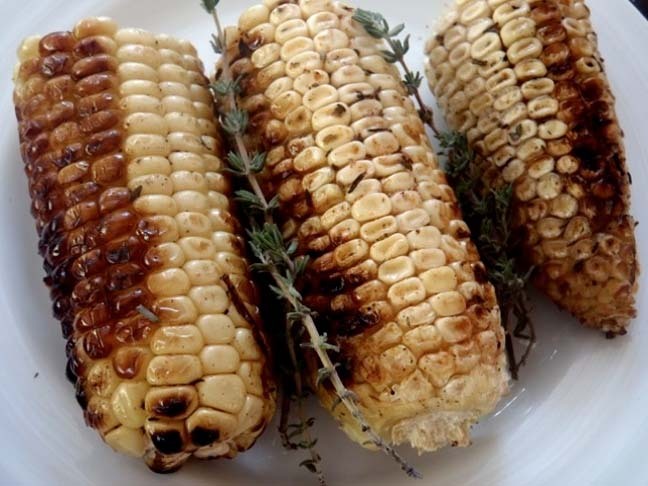 This is a very simple recipe for grilling corn, which is an excellent accompaniment to just about any main course. I love fresh thyme because it's so aromatic, flavorful, and pretty! The thyme with the lemon juice is a great complement to the super, sweet, crunchy corn. It's absolutely divine! Kids and adults alike will love this! Preheat your stove-top grill or barbecue. In a small mixing bowl, combine the oil, butter, thyme, and lemon juice. Season it to taste with salt and pepper. Pour the mixture on a large, flat platter, and coat each ear of corn with it. Place the corn on the grill. You should hear a strong sizzling sound — if you don't it's not hot enough. Wait for the sizzle! Grill the corn for about 6 minutes, turning them throughout the cooking process. You can also cute the kernels off the cob when it's cool and add it to a salad or guacamole! Yum!